In televised Star Trek, one of the first times that we heard about the Dominion was through Quark, who was looking for business opportunities in the Gamma Quadrant. He met with Dosi and Karemma merchants, who he found shared the Ferengi affinities for acquisition and greed. In STCCG, though, there have never been any opportunities for the Ferengi to partner with any other aligned affiliations ... until now. 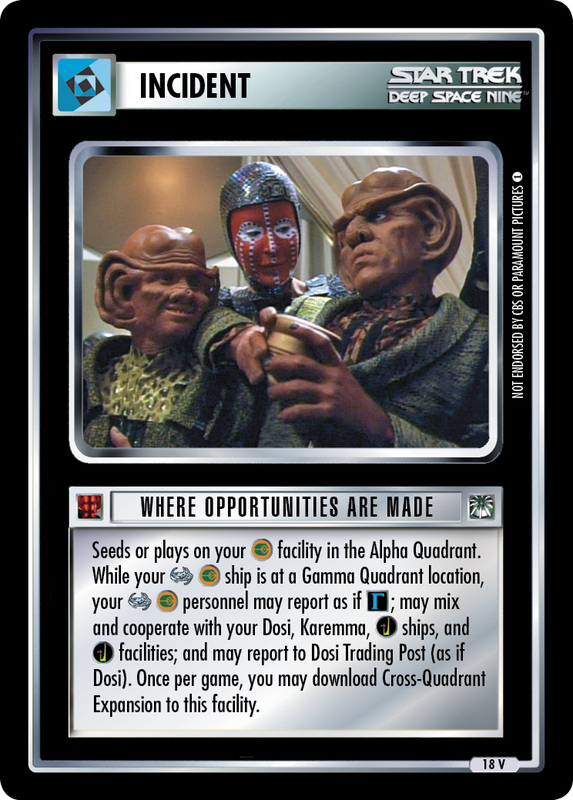 One of the three new cards in The Gamma Quadrant is for the Ferengi: Where Opportunities Are Made. In a way, this is the first Ferengi treaty. It lets your Ferengi cooperate the mercantile aspect of the affiliation: the Dosi and Karemma races, and Dominion ships and facilities. This makes sense from the show, as those are really the only parts of the Dominion that we saw Quark and the Ferengi interacting with. They didn't get involved with the political Founders or the military Jem'Hadar. Interestingly for an affiliation-specific card, the word "free" does not appear. But fret not. Recall the Dosi Trading Post from last week: it's a Dominion station which lets your Dosi (among others) report to it for free. Where Opportunities Are Made also allows your Ferengi to report to the Dosi Trading Post as if they were Dosi. But that facility lets Dosi report for free! So that's what the Ferengi are allowed to do as well, with this combination of cards. In order to use Where Opportunities Are Made, you need to have a facility in the Alpha Quadrant, and a ship in the Gamma Quadrant ... in other words, this does encourage you to venture far from home. 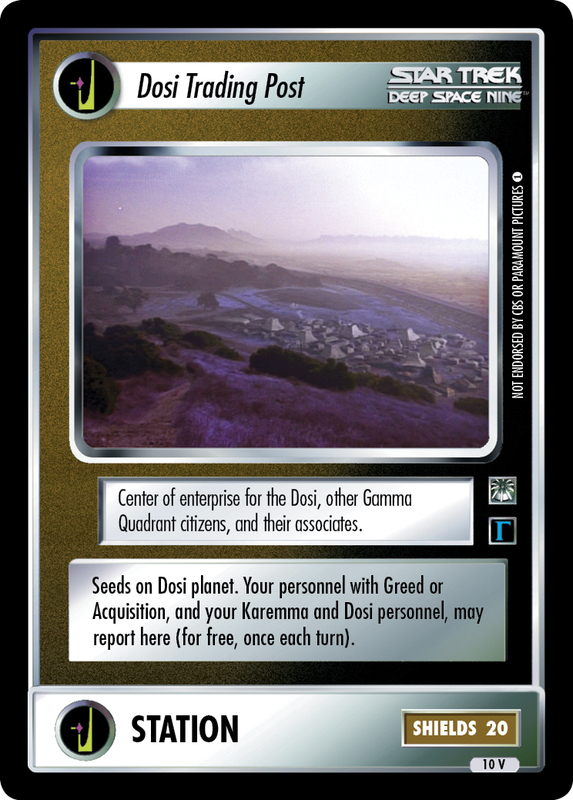 And like many other cards, you will also need to use only DS9-logo personnel and ship cards, in order to keep Reshape the Quadrant in play. The final benefit of Where Opportunities Are Made is that you can also download Cross-Quadrant Expansion. This is not exclusive to the Ferengi affiliation, and represents the efforts of any Alpha Quadrant power going through the Bajoran Wormhole. 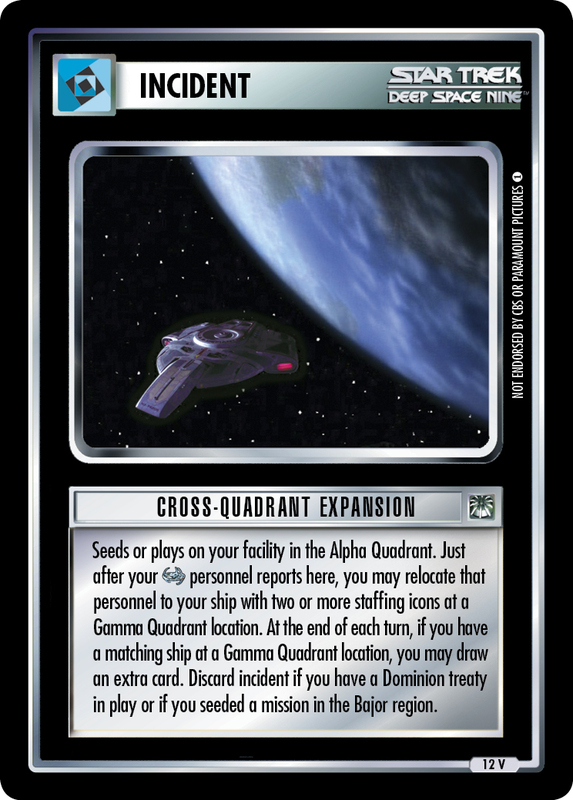 It seeds (or plays) on your AQ facility, and lets your cards reporting there get relocated instead to your ship in the Gamma Quadrant. Essentially, it's like you're reporting all your AQ personnel to the GQ, adding the benefit of whatever free reporting engines you have at that facility. However, you can't stack this with a Dominion Treaty, nor with a Bajor region mission (both would be too easy to get a ship in the GQ). That ship in the Gamma Quadrant also gives you another benefit: one more end-of-turn card draw. The story for this deck involves the Ferengi meeting at Deep Space 9, before warping off to the Gamma Quadrant to collaborate with the Dosi and Karemma. It has four Gamma Quadrant missions, all attemptable by the Ferengi and featuring Ferengi-like skills to solve. There are three facilities, all of which you'll be visiting: The Tower of Commerce, Deep Space 9, and the new Dosi Trading Post. Free plays are the big thing these days ... and you'll be pleased to know that almost everyone in the deck plays for free. And there are three (and a half, in a manner of speaking) free-reporting engines for personnel, so that depending on what cards you've drawn, you might have up to four plays a turn. One free-report engine is the Tower of Commerce, where your CIVILIAN and VIP personnel, and Mai'hardu, can report for free. A second is Quark's Bar, where you can play Quark, Rom, and the handful of Dabo girls for free. The third is the Dosi Trading Post, whose text allows free plays of Hanok, Pimoo, Inglatu, Croden, and Falow. In addition, all of the ships you might draw also report for free, since they are Ferengi Freighters, which report for free at the Docking Ports. As for your card play, you might use that for New Frontiers, which draws you more cards to fill out your free plays. Or you might use it to report one of the few personnel cards who never report for free. There are only three of them: Morn, Sakonna, and LesKels (Ah-Kel and Ro-kel). Now, all of them have Acquisition, and therefore they can be downloaded to the Cargo Bay in place of your card play. And because we have Reshape the Quadrant (and no cards which will discard it, because every personnel and ship has a Deep Space Nine property logo) and We Need You Here, those site downloads do not make you sacrifice your card draws for the turn. So in essence, even if you have a needs-a-card-play personnel in your hand, you can still use that card play on a different one instead -- whichever one you'd most like to have for that turn, without a cost of losing your card draws. The download does effectively come with one restriction, though. Instead of it being "draw no cards this turn" (printed on the site card, but ignored thanks to We Need You Here), you instead usually get an effective restriction of "download no other personnel into play this turn" (since it's fair to assume that your opponent will be playing with General Quarters -- and note that it doesn't affect the 1st Rule download, because that's to hand). And what would those other personnel downloads be? On one turn that you don't download a personnel to a site in place of your card play, you can use Defend Homeworld to download a SECURITY personnel. As you'll see in the sequence section below, the two important SECURITY personnel in the deck are Mai'hardu and Gaila, so it will likely be one of them if you haven't drawn them by the time you need them. The other download available is Brunt, downloaded by Writ. This one is interesting in that it's essentially free. At some point in the game, you turn a card draw into Writ -- either directly with Tribunal of Q, or you discard Q the Referee to get Writ and use your draw to get Q the Referee back into play. Then Writ discards to download Brunt, and he [DL] Writ again -- which you can discard for a card draw using Q the Referee. Card draw becomes card draw, but now Brunt is in play. Playing this deck follows a certain script, in the early turns. There are certain resources you want to get out early, so that the later play goes the way you want. In the Doorway phase, The First Stable Wormhole downloads two copies of the Bajoran Wormhole from outside the game, establishing the Bajor Region. Besides, obviously, being our transit between the two quadrants of this deck, this also gives us a place to have Deep Space 9, without having a Bajor-region mission which would invalidate Cross-Quadrant Expansion. You have three locations that are going to have your facilities placed at them. In the mission phase, try to arrange for them to be near each other. In the AQ, The Tower of Commerce will be at Ferenginar, and DS9 at the wormhole. In the GQ, you'll emerge from the wormhole, so you will want the Dosi planet (Further Tulaberry Talks) nearby. It's where the Dosi Trading Post will need to seed. The dilemmas I've included here are not crucial to the strategy; you can adapt them to your play style. 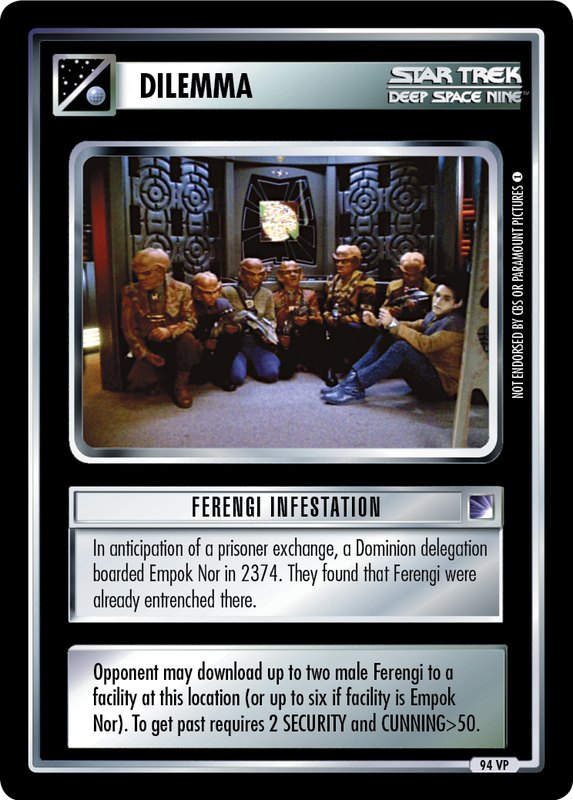 I think Ferengi Infestation fits a Ferengi deck well, though. Two more seeds download cards during the seed phase. I've listed the downloaded cards in the "Dilemma Side Deck" section, just to make the deck listing a little more readable. Remember that officially, they are part of the deck, they just get downloaded out of it before you draw your opening hand. On the first turn, of course you should make whatever free plays you have available. For your card play, you should get out Morn. Generally you will need to download him to the Cargo Bay and walk him to the Bar, but if you happen to get him in hand, then you could play him to the Bar, and later in the turn spend your "one download per turn" limit on Defend Homeworld. Morn downloads his Gold-Pressed Latinum, and immediately trades it for an Equipment card. If you have managed any free Bar reports (which are all ), get the Ferengi Rules of Acquisition -- your free Ferengi can then cycle away the cards that you've probably drawn. You don't want them in your hand just yet. You should also use the text on Where Opportunities Are Made to download Cross-Quadrant Expansion to the Tower. After Morn has obtained and then discarded the Latinum, use the 1st Rule of Acquisition to download it again (from the discard pile) to your hand, along with a VIP. For the next major step you're going to want a Nagus, so you definitely want one of those (there are 3, counting Krax) if you haven't drawn one already. 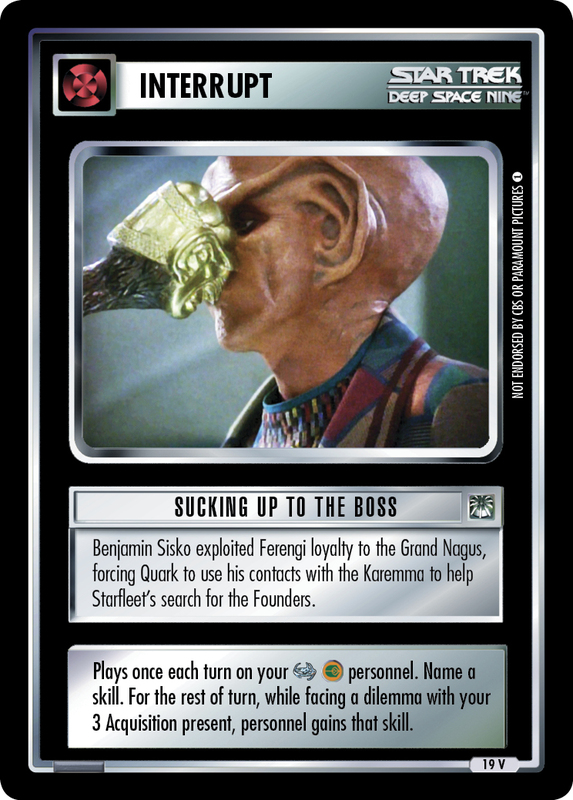 My preference among them is to get Grand Nagus Gint, as his Rule download will come in handy later. Beyond him, I tend to like Ishka (once she's in play, even if it's not from this download, that GPL in your hand becomes free). After that, Grand Nagus Zek, who is boosted by Ishka. With them at the Bar, you then activate and discard the seeded Ferengi Conference, to download to each of those Acquisition personnel a copy of the 75th Rule of Acquisition. We're planning to do our mission solving in the Gamma Quadrant, so let's get a boost from that! Now that your Ferengi have been briefed, it's time to head across the galaxy. Move everyone back to the ship ... but you've already walked this turn, you say? That's what The Celestial Temple is here for. Anyone who has walked this turn (this doesn't include anyone who was already at the Bar, such as your free plays there; or people who didn't need to attend the Conference, such as your ; or Ferengi who downloaded to the Cargo Bay and walked to the Bar on earlier turns) and can use the Temple's relocation text (this excludes Nava and Gral) can relocate there, and then relocate again directly to the ship. Morn stays behind ... he'd rather generate card draws than go on missions. You might consider leaving Zek at the Temple for another draw also, but I think that with Ishka, he's a good dilemma buster, and if he has 75th Rule, you want him solving missions. Undock, and fly through the wormhole. If you have SCIENCE and Navigation on board (e.g. Mardah and Mai'hardu), and a spare card in hand, you could use Wormhole Navigation Schematic, but this isn't crucial. When you enter the Gamma Quadrant, the game changes. Really, it does. Several of your cards have abilities that trigger when your cards are in the Gamma Quadrant. New Frontiers lets you draw 4, not just 2. (So you really shouldn't have been using it before now.) One little caveat -- this doesn't work if you're at the Bajoran Wormhole location. Cross-Quadrant Expansion gives you an extra end-of-turn draw (and the next ability). If you don't have a Gamma Quadrant personnel to report free to the Dosi Trading Post on a given turn, then any of your Ferengi -- even Mr. Brunt -- can instead, thanks to Where Opportunities Are Made. So at this point, your draw and play engines probably look something like this. You play three cards per turn: a free or at the Dosi Trading Post, a free CIV/VIP "to" the ship, and your regular card play, which might be another personnel either to the Trading Post or "to" the ship, or New Frontiers for four draws. And you'll be drawing three cards at the end of each turn, thanks to Morn and CQE -- four if you have Zek at the Temple. Then there are the jumpstart downloads of Writ and Defend Homeworld -- thanks to the relocation feature of CQE, these may as well wait until this phase of the game, so that you can use your once-per-turn downloads in phase 1 for sites. A more obvious aspect of being in the Gamma Quadrant is that now your Alpha Quadrant entrepreneurs can join with their Gamma Quadrant brethren! All of your personnel can mix, and can board the station. One small problem (which I found when playtesting this deck) is that Where Opportunities Are Made fails to make your personnel compatible with your ship. For that reason, you will want to use Hidden Fighter to download the Flaxian Scout Vessel to the Dosi planet. It's the only ship here that your personnel will be able to board. It needs a pilot, which might be Croden or Falow, or Sakonna or LesKels, or even a dual-affiliation like Aluura or the Maquis version of Quark! (Note also that Sakonna brings out the best in him, boosting him to a greater skill density.) If you haven't drawn Hidden Fighter by this point, Gaila will download it. If you haven't drawn him yet, then you should use the Defend Homeworld you've been saving. Now you have the bulk of your personnel together, ready to attempt these juicy Gamma Quadrant missions! One more boost before you do, though: make sure to play 62nd Rule on them before the first attempt. Hanok and Grand Nagus Gint each have a general download, which should be used for this. Also, once you have Mai'hardu in play (which might be as early as the first turn, and also might be your DH download if you didn't need it for Gaila), he should download the Scepter, which lets your Nagus play the 62nd Rule for free ... anywhere. With the boosts from the two different Rule cards, Gamma missions should easily become 50 points each. (More, really, if you somehow don't face In The Zone.) Solving three of them is enough for victory conditions -- two if your opponent doesn't happen to be using You Are A Monument. But if you do really want to come back and solve an AQ mission, note that as long as you leave a Freighter in the Gamma Quadrant (as this enables the affiliation mixing), your Dominion friends will let you attempt Ferenginar with the original requirements. Three personnel in the deck (Nog, Hanok, and Zek) can meet all the requirements single-handledly. For getting through dilemmas, your personnel have some impressive coverage of the skill matrix already. There are a few gaps, but they can often get filled using the new Sucking Up to the Boss. This conversion is a little less strong than it used to be, but it is still quite useful. You have to play it -- and announce the skill to be gained -- before the mission attempt (because it's not a response to anything), but then the person will gain that skill during all the dilemma encounters. You need 3 Acquisition, which can include the personnel you play it on. And really, in this deck that's not a skill you're going to run out of. You also need to know what skill you need to add. Unless you really know what's coming, its practical benefit is that it will help you pass a wall after you've failed it once. So, you can get a second Astrophysics for Emergency Conversion, or a second Exobiology for Odo's Cousin (if you actually see those used.) You can even get a doubled skill, if you add it to Zek with Ishka present. Home is where the heart is, but the stars are made of latinum.